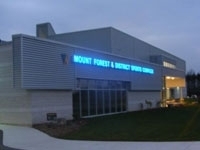 Opened in 2008, this state-of-the-art facility features an NHL sized ice surface / arena floor, indoor running / walking track, seniors room and dressing rooms. In addition the large Community Hall is perfect for wedding receptions, dinners, dances and trade shows. Also featuring a Leisure Hall, Meeting Room, Plume Room/Sports Club the facility can accommodate all your needs.